New Delhi: Calling for expanding health services, particularly in rural areas, President Pratibha Patil Wednesday said there was need to provide quality and affordable medical facilities to people. Addressing the nation on the eve of the country's 63rd Republic Day, Patil said: "We need to expand health services, particularly in rural areas." "We need quality medical facilities for our population, which are affordable. In today's era of Information, Communication and Technology (ICT), technology can be very useful in our mission of health and education," she said. Emphasising that health and education sectors were fundamental for developing human resources, Patil said: "Education must reach every section of our society, as must access to health reach all." 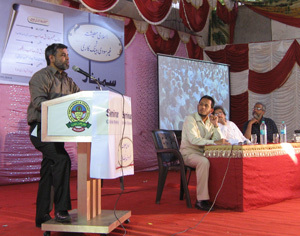 Dr Shariq Nisar, Director of Research and Operations of India’s premier shariah advisory firm TASIS and one of the senior most professionals of Islamic Finance in India, was in Malegaon on Sunday to address a seminar on "Prospects of Islamic Finance in India".